The Slav Epic (Slovanská epopej) is a series of twenty monumental canvases (the largest measuring over 6 by 8 metres) depicting the history of the Slav people and civilisation. Mucha conceived it as a monument for all the Slavonic peoples and he devoted the latter half of his artistic career to the realisation of this work. The idea of the work was formed in 1899, while Mucha was working on the design for the interior of the Pavilion of Bosnia-Herzegovina, which had been commissioned by the Austro-Hungarian government for the Paris Exhibition of 1900. In preparation for the assignment he travelled widely through the Balkans, researching their history and customs as well as observing the lives of the Southern Slavs in the regions that had been annexed by Austria-Hungary two decades earlier. From this experience sprang the inspiration for a new project – the creation of ‘an epic for all the Slavonic peoples’ that would portray the ‘joys and sorrows’ of his own nation and those of all the other Slavs. Between 1904 and 1909, Mucha visited the United States five times in hopes of finding a benefactor who would support his ambitious project and eventually, on Christmas Day 1909, he secured sponsorship from Charles Richard Crane (1858-1939), a wealthy Chicago-based businessman and philanthropist. Crane was intensely interested in the development of political affairs in Eastern Europe and Slavonic culture and he was to provide financial and emotional sustenance to Mucha for almost twenty years. Mucha returned to his homeland in 1910 to take up his mission. Between 1911 and 1926 Mucha’s energy was taken up with the creation of the Slav Epic. For this project he rented a studio and an apartment in Zbiroh Castle in Western Bohemia to benefit from the spacious studio enabling him to work on enormous canvases. In the series, he depicted twenty key episodes from the Slavic past, ancient to modern, ten of which depict episodes from Czech history and ten on historical episodes from other Slavonic regions. The first canvas in the series, The Slavs in Their Original Homeland, was finished in 1912 and the entire series was completed in 1926 with the final canvas, The Apotheosis of the Slavs, which celebrates the triumphant victory of all the Slavs whose homelands in 1918 finally became their very own. With the Slav Epic Mucha wished to unite all the Slavs through their common history and their mutual reverence for peace and learning and eventually to inspire them to work for humanity using their experience and virtue. In 1928, Mucha and Crane officially presented the complete series of the Slav Epic to the City of Prague as a gift to the nation, coinciding with the 10th Anniversary of its independence. 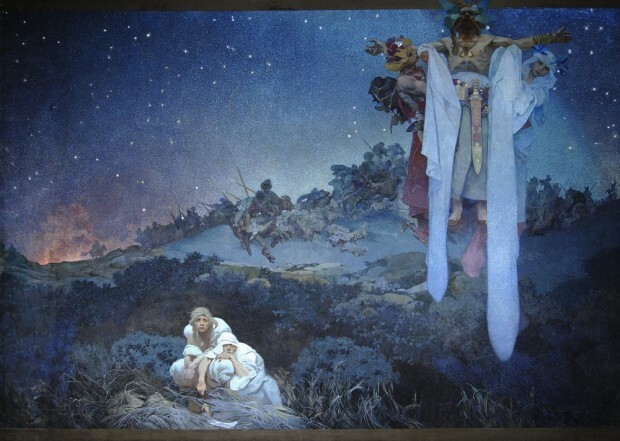 Mucha chose to start his history of the Slavic people in the 4th to 6th centuries. At this time, the Slavic tribes were agricultural folk who dwelled in the marshes between the Vistula River, the Dnepr River, the Baltic Sea and the Black Sea. With no political structure to support them, their villages were under constant attack by Germanic tribes from the West who would burn their houses and steal their livestock. The couple hiding in the bushes in the foreground as their village burns on the horizon are the survivors of one of these attacks. The fear and vulnerability expressed in their faces beseeches the help of the viewer. A pagan priest flanked by two youths symbolising war and peace floats in the top right of the composition. These figures foretell the peace and freedom that will come to the Slav people when independence is gained through war.